A passionate and compelling story of love, friendship, and honor filled with unexpected turnings, mystery, intrigue, and romance to delight fantasy lovers in all ages. CAN LOVE MEND A HEART FULL OF HATRED? Small town girl, Molly Bennett, moves to Los Angeles where she becomes an outsider while attending Beverly Hills High School. It seems life cannot be any more dreadful. Then one day after school, something magical happens. On a secluded hike in the Hollywood Hills, Molly chases her disobedient mutt and only friend into a hidden cavern. She stumbles upon a strange glimmering gateway that transports her to Arkana, a planet that is the cradle of an advanced human race. There, teenagers navigate amazing flying vehicles, compete in perilous games for glory, and possess supernatural powers. While Molly tries to wrap her mind around this unbelievable discovery, she meets the alluring and mysterious Victor Sorren. He is a Sentinel Apprentice, whose hatred toward people from Earth is beyond understanding. Yet every time Victor unpredictably saves Molly’s life, his heart draws closer to hers, no matter how much he tries to fight against it. It further complicates things that their growing friendship is strictly forbidden. Earth people are prohibited in Arkana, yet Molly continues to cross through the portal to Arkana to see Victor. Torn between their double lives, they go down a dangerous path, from where there is no return and multiple endings. This book is free from 04/13/2019 until 04/14/2019. Whelan writes YA romantic fantasies, inspired by her fascination with the ancient Egyptian culture, 19th century London, and our vast universe. 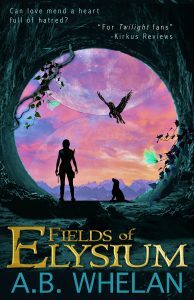 Her beloved and award winning 'Fields of Elysium' series captured the hearts of all ages. Whelan also a bestselling author of psychological thrillers.